We have been receiving a number of calls regarding the wildfires in our area, especially in Gatlinburg, Tennessee. Thankfully, we are fine and not affected by any of the fires. We do ask for your prayers for our friends and colleagues in Gatlinburg. It is a dangerous situation there and we need to pray for everyone’s safety. As I mentioned, we are safe and are operating on a normal schedule. The Polar Express is also fully operational. The only inconvenience for our guests coming from Tennessee is that Highway 441 from Galinburg/Pigeon Forge through the Great Smoky Mountain National Park is closed. Folks coming from that area need to use I-40, to Waynesville, NC, then Hwy 74 W to get to Bryson City. We do not take our blessings for granted. This situation could easily been reversed and our inn placed in jeopardy. Thankfully, we received some rainfall last night and more is forecast for tonight and tomorrow. Every drop is needed for the fires and our ongoing drought. Most of you undoubtedly know about the wildfires in Western North Carolina. We have received calls and emails of concern about our personal safety and that of Hemlock Inn. Thank you everyone. Let me say first and foremost, we are fine and the inn is not in danger. We are about 10-20 miles away from the nearest fires. We are experiencing lots of smoke but no flames. We continue to operate mainly weekends through the end of December, and do not plan any change in our schedule. We are blessed. But, there are numerous fires in our region, as many as 17-20, and tens of thousands of acres have already been scorched or threatened. This is a serious situation brought on by a record drought and all the dry falling leaves of autumn. Firefighters from all over the country are in WNC working around the clock. We hear that the biggest fire to us, located in and around the Nantahala Gorge, may be fully contained within a few days. Fortunately, I have not heard of any structures destroyed at this time. We appreciate your concerns and covet your prayers. We ask that you remember all the firefighters working so hard. We need to pray for their safety and endurance as they work monstrously long hours. We also ask that you remember those in this area that are affected by these blazes. There have been some precautionary evacuations, so lives are being disrupted and adversely affected. Lastly, we ask you pray for rain, and lots of it. This is the worst drought I have seen in the 29 years I have lived here. I am told, it is the worst in 4 decades. Even when we get the fires under control, we will not be out of danger until we can get some much needed rainfall. Thank you all for your concern. I once again must repeat….WE ARE BLESSED. There has been no loss of life or structural damage, and good people are working tirelessly to see none of that happens. The inn is safe and continues to operate as usual. We do not take our good fortune for granted and are very appreciative for all of you who are praying on our behalf. I am devastated. My favorite tree on our 57 acres is a large white oak that sits at the end of our parking lot, near the lamppost and walkway up to the inn. I don’t know how old it is, but it is massive and perfectly shaped and provides shade for our front yard all the way to the Rondette. It is the tree I see as I sit in the office. To me, this tree is the symbol of strength, health, and endurance. I thought it would long out live me. I was wrong. Last week, while I was away from the inn, I received a call from one of our housekeepers informing me a large branch had fallen from a tree. We have lots of trees and this is not an uncommon occurrence. We have also cut down several trees recently that were potential dangerous. We have also identified several others that would need attention pretty soon. When the housekeeper called, I was having trouble understanding which tree she was referring to. I assumed it was one we were watching. Instead, it was, the big, strong oak tree I loved so much. When I finally realized this, I was speechless and could not believe it. I returned to the inn and discovered it was really more than a single branch, nearly half the tree had fallen and was covering half the front yard and the drive way down to the Woody Cottage. We would have to clean it up fast because we had guests coming for Labor Day weekend, but we had to face another hard reality. The remaining tree was heavily weighted to one side. It was safe for now, but we would have to take down the rest of the tree. I grieved. To me, the oak tree represented Hemlock Inn in a way. It was a small tree when the inn opened in 1952. It grew over the years. It endured storms of wind, rain, lightning, and snow. It remained strong. Hemlock Inn has grown over its 64 years from a small 8 room inn open just a few months in the summer, to its current size of 25 rooms, three cottages now open nine months of the year. It has experienced growth and endured changes. It has survived the great financial crisis of 2008 that still lingers to some degree. It has seen changes in guest needs and desires and the challenges of increasing competition in recent years as our area grew and added many more rental rooms and cabins. But the inn has remained strong because its foundation is sturdy. The trunk of the oak tree is still sturdy and strong. But we are told that up 8 or so feet up the tree, where the huge branches begin to spread out, there was a pocket, unseen and unknown to any of us. Over many, many years, that area collected water. In the winter, the pool of water would freeze, creating cracks and would be filled with rain water the rest of the year that very slowly ate away at the tree. The strain finally came too much, and it gave way. It was a flaw we never knew existed and it secretly ate away at this giant symbol of strength. There is a lesson there I guess. Perhaps we should all realize we may have little secret flaws in how we handle our lives that need attention before they grow and cause major damage. Or perhaps, we can recognize that some folks have physical issues that affects their lives. We need to love them more and admire them for staying strong under conditions we do not experience. Maybe the real lesson here is that no matter what, our base, our foundation of beliefs, and actions must remain firm at all cost. Our branches may fall and may threaten our way of living, but our being is intact. I will miss the oak tree, but its usefulness will continue. We are asking the tree cutters to save the lumber. We will eventually cut it into the proper length and spilt it for firewood. Then every time we build a morning or evening fire, we can not only bask in the glow of the blaze, but also remember the big oak and give thanks for its years of shade and coolness and now its warmth. Once we remove the big oak, we will see another oak as well as a dogwood just behind it in the woods surrounding the Rondette. They will now have more room to expand and grow. Perhaps, in time, we will marvel at this marvelous and splendid tree. Life continues to throw us curves, only to bless us as well. Our Sunday routine is pretty simple, just like all our other days. We ring the bell and serve our family style home cooked breakfast promptly at 8:30am. Sunday’s breakfast is always scramble eggs, cheese grits, local sausage and gravy (store bought sausage just doesn’t cut it), fresh strawberries from a local farm, biscuits, and bran muffins. Most folks finish around 9:00-9:15am unless they have a few stories to tell their table mates. Sunday is a “turnover day”. Most of the guests checkout to head back home. It is usually one of the busiest mornings of the week for us. Checkout time is 11:00am. This is pretty standard. It’s not too early and gives the guest plenty of time to pack the car, pay their bill, and depart. And it still gives housekeeping ample time to clean the rooms for the next guest. So after breakfast, some of the guests work their way into the office to “settle up” and some return to their rooms to clean up, pack, and get ready to leave. Most Sunday mornings…..most guests….but not always. The mixture of guests this weekend included a small family gathering (do I ever write a post or blog without mentioning family reunions or gathering? ), a variety of couples both young and older and a single lady who came to the mountains to visit the casino in Cherokee to play live poker. After breakfast, some gathered on the front porch to visit just a bit longer, some took their last cup of coffee out to the deck to sit and take in the beauty and coolness of mountain mornings. Often you can catch the glimpse of a deer in the meadow below the deck. This morning, someone spotted a small red fox near one of the cottages. The moments continued and it wasn’t too long that I heard the sound of bean bags striking our corn hole platforms. It seems a spontaneous game had broken out in one of the families and there was a spirited game on the front lawn. I smiled as I listened to the laughter and ribbing that ensued. I glanced out the once and was surprised to see one of the contestants was our lady gambler and she was having a ball. I’m not sure how many games were played, but it took on a life of its own and no one was in a hurry to stop. Another game started as soon as one was completed. Around 10:00am, the games subsided and the family members sunk back into the rocking chairs to have one last conversation. I assumed our lady gambler had gone to her room, because I knew she was eager to make her way to the casino. I expected her to go last night after dinner, but she told me she was just too tired and wanted to rest. I thought she would leave directly after breakfast, but she was the last one to finish her meal and the first one to join in the corn hole tournament. Cleanup in the dining room was almost complete and I worked my way to the office to assist those checking out when I heard voices on the back patio and a clattering racket. I recognized it immediately. Someone had found the Skittles Game, an old mountain game where you wrap string around a spindle, pull it as hard as you can to get the spindle spinning in an attempt to knock down as many wooden pins as you can. I peeked around the door to discover an eleven year old girl and , you guessed it, our gambling lady giggling as they played the game over and over. Finally, around 10:45am , the game suddenly stopped when the lady checked the time. She smiled and told her new friend she had to go to her room. It was almost time to leave. I smiled too, reflecting on our guests who met new friends and enjoyed themselves up to the last minute. I didn’t mind they played so long. It was only 10:45 and after all, checkout wasn’t until 11:00. Our Memorial Day Weekend just ended and it was a good one. It was good not only because we had lots of folks here, but also because of the quality of those guests. First, we had a family reunion consisting of old friends and regular guests from Oklahoma enjoying a special time together. There were other repeat guests here as well, coming for another “Hemlock Experience”. We love our regulars and are humbled they return to visit so often. But we also had a fair number of guests who were here for the first time. We like to spend as much time as we can with every guest, but we are always intrigued by new folks. We can’t wait to sit down over dinner and get to know them. The group this weekend was especially delightful. The first that comes to mind was a young couple from London. They flew into Atlanta late at night for a two week visit to the states. Hemlock Inn was their first stop. 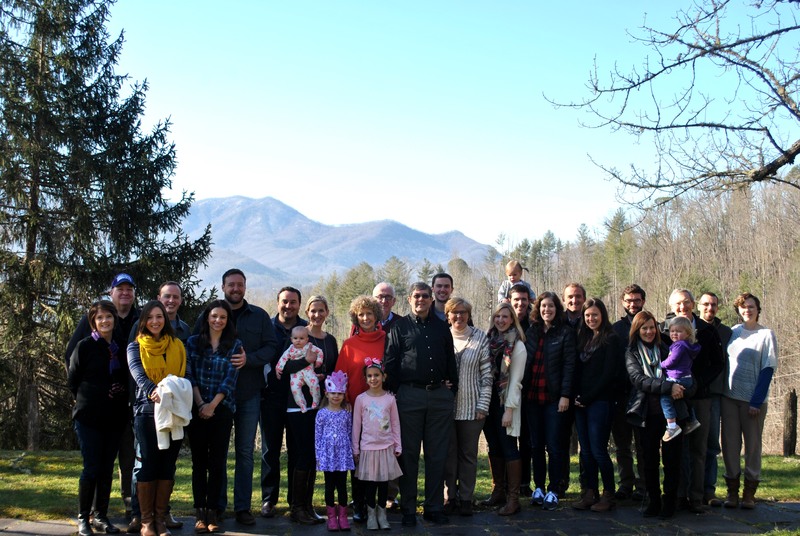 They loved their stay in our mountains, spending their days hiking in the Smokies and seeing all they could before heading to Nashville, Memphis, and New Orleans. Someone at their table asked them how they ended up at our small inn in a small town in western North Carolina. I was not at their table for this conversation, but was told their response was …”We were looking for a place like this…”. They wanted a place that was small and friendly; that was steeped in the culture of the area and whose food was genuine cuisine of the region. They were delighted to discover an added bonus with our family style meals and lazy susan tables. They loved getting to know other guests and sharing experiences. They were not looking for cookie cutter place and certainly not a chain with everyday meals. They wanted a unique experience and found it. First of all, it goes without saying that our guests love visiting the area with its natural beauty and outdoor activities. But that conversation peaked my interest and I started paying more attention than usual as to why our new guests specifically chose our inn when they decided to visit the area. What I discovered was heartwarming and affirming. Some were referred by friends telling them if they came to this area, they HAD to stay at Hemlock Inn (there is no greater compliment than to have our guests refer their friends to visit us). Character and real homespun hospitality was very important to others. It was important to them to find a place that was genuine and exhibited the values they admired. Most found us on searches using the internet or social media, but all were looking for something different than the routine. They wanted an experience, not just a room. None of our new guests this weekend knew anyone else here when they arrived, but they left with hugs and exchanged addresses. Summer is upon us. Schools will be letting out for the summer soon and the traditional vacation season will begin. We encourage you and your family to take trip and experience America. There are wonderful things to see and do all throughout our country. And there is no substitute for family time. 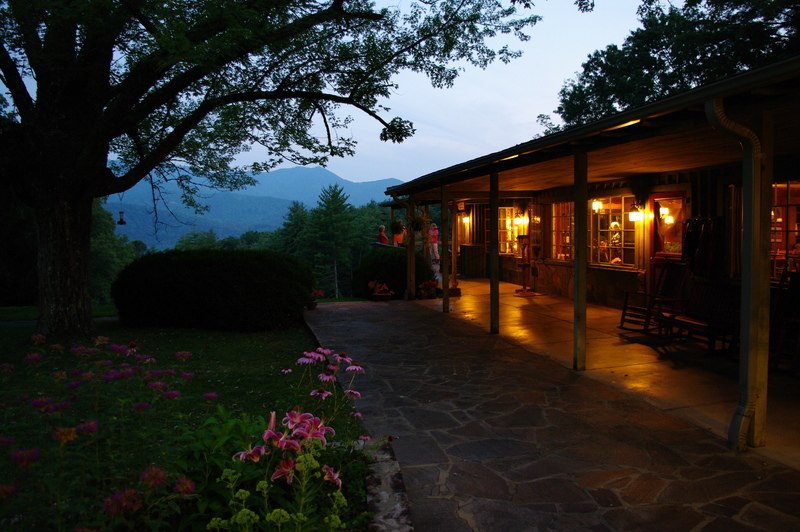 If your travels brings you to the Great Smoky Mountains in Western North Carolina, we invite you to try Hemlock Inn. If you have been here before, you know what to expect. If you have never visited us, you may find that we were just the place you’ve been looking for…. As you are probably aware, 2016 marks the centennial of the National Park Service. All year long, there will be special programs and information about the wonderful national parks in our country. I love to watch CBS Sunday Morning News (taped of course. Sunday mornings are usually a bit busy around here). Every broadcast this year will include a hike in one of the parks. The Great Smoky Mountain National Park is by far the most visited park in the system. It has twice as many visitors each year than any other park in the country. It is a national treasure, and it is virtually in our backyard and easily accessible to millions of Americans living in the eastern United States, including many of you. We invite you to celebrate the centennial of our National Park System and come visit the Great Smoky Mountains National Park this summer. There is a world of beauty and outdoor activities waiting for you. It a land of adventure. 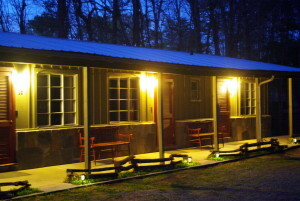 Hemlock Inn is located next door to the park and is available to help experience the Appalachians. Let us know how we can help. 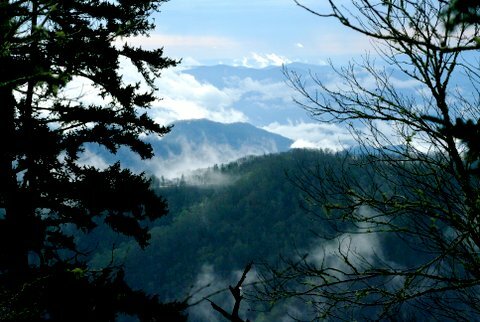 Beautiful Smoky mountain vista, photographed by Hemlock Inn innkeeper Mort White. 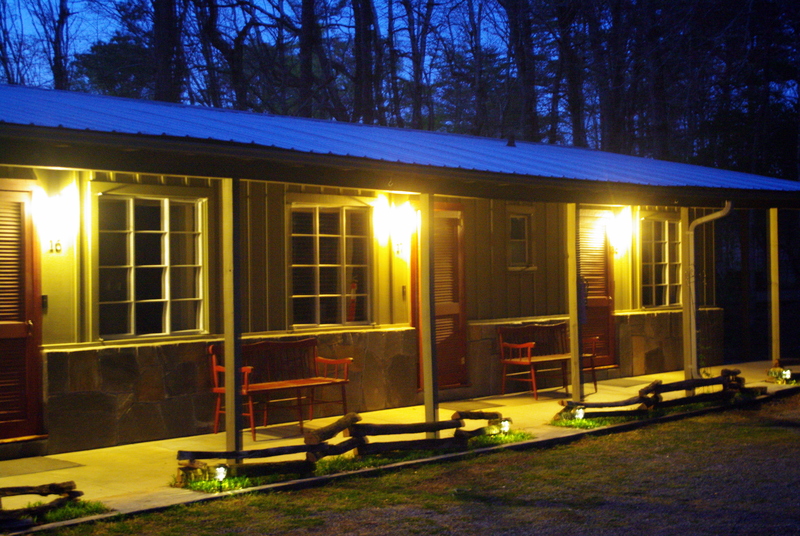 Hemlock Inn opens for our new season in one week…on Wednesday, April 20. We have been working very hard for the last month getting ready for you. For those who have been to the inn, you will immediately notice a few changes. The most noticeable change will be in the second building. We have torn off the entire roof, done some repair, and installed a new metal roof. In keeping with our Appalachian theme, we wanted a barn tin affect. The new roof is light and a bit shiny for now, but that will be tempered over time. We also added a split rail fence and some pagoda lights to further enhance the look. In the first building, we dramatically cut back the large boxwood hedge (don’t worry, there is still some green growth and they will grow back quickly). It was so large, guests in the building couldn’t look out the widows in their rooms and see the mountains. We also had to cut down the large silver maple tree. It has served its time and was dying. With the boxwoods trimmed and he tree gone, the front yard really opened up and our mountain view became so much more pronounced. We also added a spilt rail fence along the building. We also cut down the large pine tree beside the Rondette for safety reason, but in doing so noticed that its removal also opened up a better view towards the Blue Ridge Parkway and Waterrock Knob. Rooms 10/11 and 18/19 are now permanent two room suites. We took out the double bed in the back room and put in a new king bed. So the suites now have two rooms with a king bed in each room, two bathrooms, a sitting area in the larger room with a sleeper sofa. We hope you like them. We brought in a number of new mattresses for our beds, did some painting, and rearranged some rooms. All this is designed to make your stay more pleasant and ever. We added more shelving in our library so all our books, including the children’s books and Ella Jo’s cookbook collection are together in one location. We will do more as we can. But some things will not change. George and Donna will still be here preparing our wonderful homecooked meals (no shortcuts here). We will still offer warm southern hospitality. We will still have wonderful views, peaceful setting, and friendly atmosphere. It’s election year. Get away from all the madness and come to the mountains. We are waiting for you. Winter time is family time for us. The Inn is closed most of January, February, and March. For us, this is the time we use for rest, relaxation, and family. 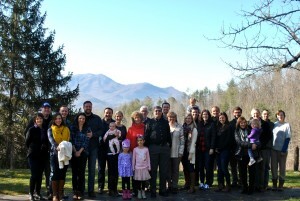 We went to Florida for some personal time of rest early in the winter, and then took trips to Durham, NC, Wake Forest, NC and Hampton Falls, NH to see all of our boys, their wives, and our two precious granddaughters. Fortunately, we got to spend a good amount of time with each. It was a special and sweet time for us. But the winter of 2016 was also a time of added significance….. it marked the 100th birthday of my late parents. My mother, Blanche Campbell White was born on February 27, 1916 and my father, Claude Williams White, was born just a few days later on March 4, 1916. So this would have been the centennial birthday year for both. We did the only sensible thing, we threw a 100th birthday party for them here at the inn the weekend of February 26-27. All of my sisters and my brother came as well as most of their children and grandchildren. In all, 28 of us gathered to remember my parents; celebrate their birthdays; study our ancestry; share memories, pictures, memorabilia; and laugh a whole lot. It was a special time and we don’t do it enough. A couple of weeks later, Lainey and I went to Baltimore for an appointment. Rather than return directly to the inn by way of Interstate 81 in western Virginia, a busy and truck laden road, we decided to come home a different way. We drove down the eastern shore of Maryland and Virginia, across the Chesapeake Bay Bridge and Tunnel south to Elizabeth City, NC. This was the birthplace and childhood home of my father. We have never known much about my father’s family. His parents, my grandparents, died in 1932 and 1946. Dad tragically died in 1968. We never had much time to discuss his family. But here I was in Elizabeth City and, thanks to a lot of research done by my sister and brother-in-law, we found the gravesite of the grandparents I never knew. Even more astonishingly, we also found the family burial plot of my great-grandparents located in the back of an old cotton field in a very rural area way out of town. I stayed for quite a while, not wanting to leave. I am convinced, more than ever, that the family is the backbone of our society. It is what hold us together, gives us continuity, instills our values and beliefs, and provides the love, support, and stability we need to cope in the crazy, stress filled world we live. Outside our faith, I believe family is our most important cornerstone that determines who we are and how we live. Gatherings, like we had in February, are crucial to maintaining that connection. And yes, it goes without saying, the contact we have with family needs to be face to face, with hugs, kisses, and lots of smiles. Sorry, social media just doesn’t cut it. As my boys have moved away from home, married, started their own families and homes, this task becomes more difficult but none the less important. Lainey’s and my role has changed from rearing and instructing our children to playing with and spoiling our grandchildren. But I want my sons and their families to know their family history and heritage. I want them to know about their grandfather, who quit school in the 10th grade, only later to earn a doctorate degree. I want them to know about their grandmothers on both sides who lived lives of love and caring and compassion. I want them to know why Lainey and I are like we are and in turn why they are like they are. I want them to live for the present, prepare for the future, while being ever cognizant of the stock from which they came. I want them to feel the love of our families, generations of them. These are turbulent times in which we live. Sadly, campaign years seem especially distressing. I encourage you to turn your attention away from ugly discourse filled with insults and hatred and instead turn your eyes to your faith and your family. And I encourage your to spend time with your family as much as possible. 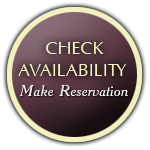 We would love to have you visit Hemlock inn, but if you don’t come here, go somewhere where you can be with those your love. Our best wishes go with each of you and your families. Thank you for sharing time with us over many years. We will open April 20th for our new season.